Goshtasb, Farzaneh & Nadia Hajipour (eds.). 2014. Admonitions of Ošnar-i Dānā. Tehran: Institute for Humanities and Cultural Studies. The (h)andarz ī ōšnar ī dānāg “The Counsels of the wise Aošnar” (AŌD) is the conventional name of a short didactic treatise in Middle Persian belonging to the so-called andarz “wisdom-literature”. AŌD is pseudo-epigraphically ascribed to Aošnara- pouru.jira “Aošnara, the very wise”, a sage mentioned in Yt.13.131. He is also mentioned in Dēnkard VII.1.36 (DkM 598) to be coeval with the primeval king Kay-Kāōs. The frame story of AŌD is a so-called “number-litany”, in which a disciple asks the sage to give an andarz “wise saying” for every number from one to thousand. However the extant manuscripts of AŌD contains the andarz only up to number six. The six extant manuscripts containing this treatise are: 1. K20 (the University Library in Copenhagen), ff. 143a–148a, folio 145 lost. K20, dated to second half of the 14th–first half if 15th cent. is the most complete extant manuscript of AŌD, which the current edition is based mostly on it; 2. P33 (Bibliothèque nationale de France, Paris), ff 120b–125b, folio 123 lost in the middle. It is an exact copy of K20 dated probably to 1737; 3. M92 (Bayerischen Staatsbibliothek, München), ff 107–112. It is a transcript of P33, copied by M.J. Müller; 4. R410 (K.R. Cama Oriental Institute, Mumbai), pp. 24–27 (contains only the first twenty-two paragraphs); 5. C165 (K.R. Cama Oriental Institute, Mumbai), a transcript of R 410 (again contains only the first twenty-two paragraphs) and 6. TD26 which has a different structure, containing some andarz, which are not known from the former manuscripts whereas lacking some other. The authors put forward the thesis that TD26 contains some materials from lost original text, doesn’t transmitted in other manuscripts. 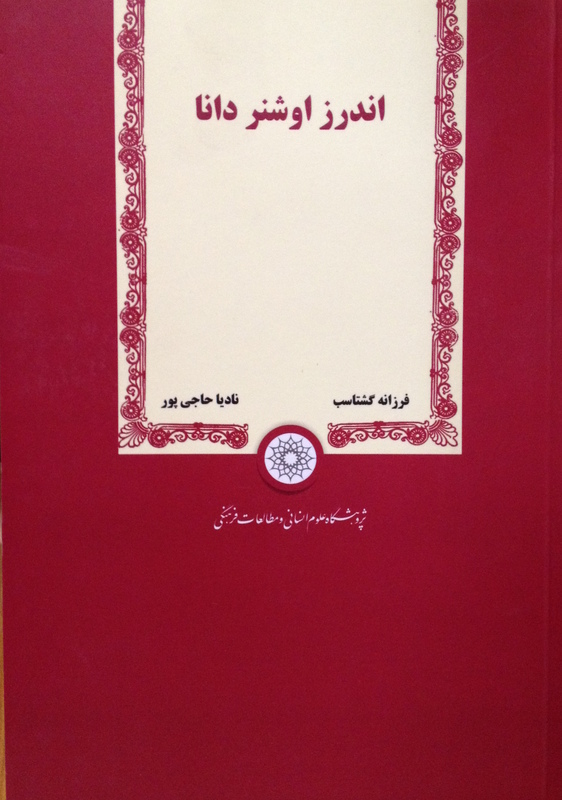 The current volume consists of an introduction, the Middle Persian text in both Pahlavi script and its transcription following with a Persian translation and notes. A Middle Persian-New Persian glossary and a rendering of the manuscript TD26 in Pahlavi print script conclude the book. This edition is based on manuscripts K20, considering also variations in manuscripts P33, M90, R410 and C165. Farzane Goshtasb (PhD) is Assistant Professor of Ancient Iranian Culture and languages in the Institute for Humanities and Cultural Studies, Tehran. Nadia Hajipour is PhD student of Ancient Iranian Languages. Goštāsb, farzāne; ḥāğipūr, nādiyā. 1393. andarz-e ušnar-e dānā. tehrān: pažuhešgah-e ʿolum-e ensānī-o motāleʿāṭ-e farhangi.